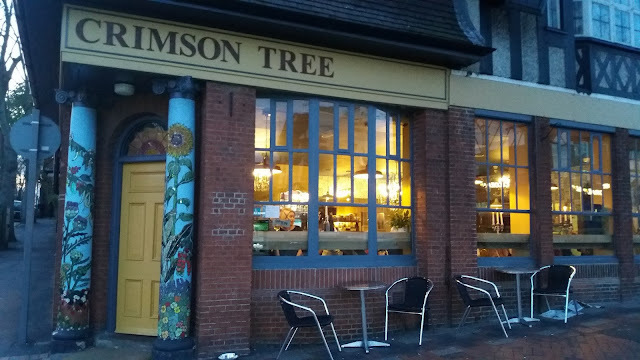 The Crimson Tree has been in Sherwood for a good number of years now. Having formerly been situated on Mansfield Road close to the Sherwood Manor they've recently moved close by into what used to be the old Police Station into a larger property. We've been driving past and seeing the pretty lights throughout the winter although hadn't taken the plunge to visit until recently. Meeting Mark for a catch up in Sherwood last week seemed like a great opportunity to try out somewhere new and so we headed up from finishing a quick pint in the Joseph Else up the hill to the Crimson Tree. Inside the Crimson Tree is a lovely, inviting dining space. It's open and friendly whilst having a relaxed air. As we hadn't booked as it was a Wednesday Night we were advised that most of the tables had been booked and were given a table beside the the selection of cakes which would feel like absolute torture with our love of a good dessert. We were sat beside all these cakes- Absolute torture with my sweet tooth. The Crimson Tree evening menu is relatively simple with a selection of pizzas, salads and sides to choose from. 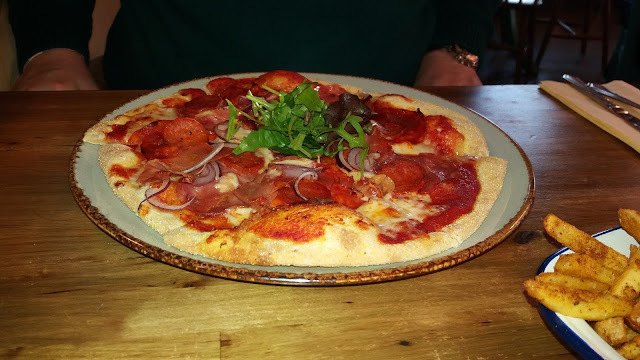 We opted for their own take on a meat feat with premium Italian hams and Salami, as well as a good old traditional Margherita. We added some Chicken Wings and Cajun Fries too to make it more of a meal. 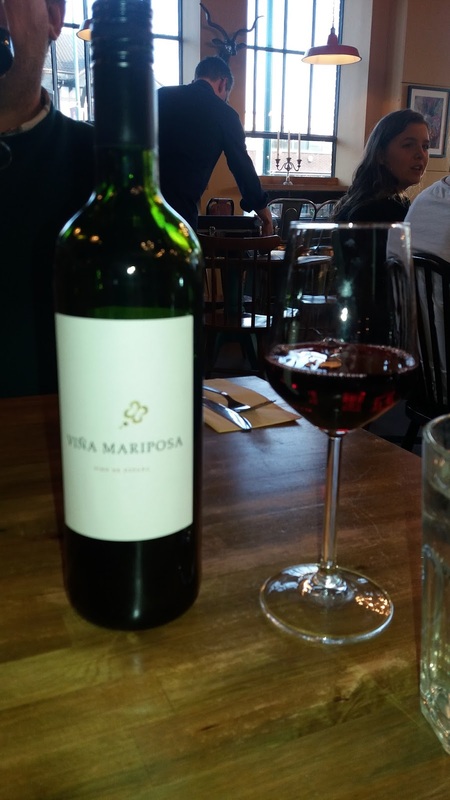 Mark opted for a very nice bottle of Vina Mariposa Red Wine for £9.99 which we felt reflected excellent value for money for a very nice, well bodied red wine. Well worth trying. 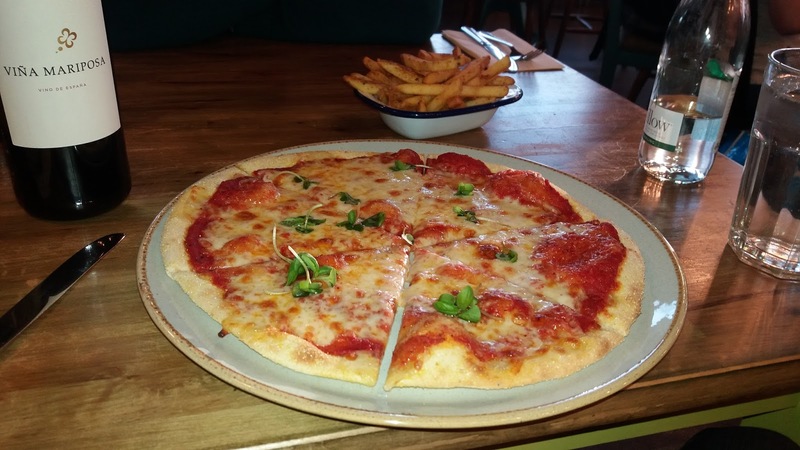 The Margherita Pizza came out looking just as we'd expect. With a thin and crispy base, a sensible amount of tomato sauce and plenty of cheese. Taste-wise it was a simple take on an Italian classic. Nothing special but nicely done. We've had similar for 5 euros by the beach and whilst I'd have liked some slightly bolder flavours and maybe a hint of basil that's me being rather picky. Marks Meat Feast with red onion looked more of a masterpiece with premium Italian meats. He was very happy with his choice although we both felt the bases may have needed just slightly longer in the oven to go really crisp as there was a little doughy-ness to them. (If that's such a word!). The Cajun Fries we had alongside were fantastic. 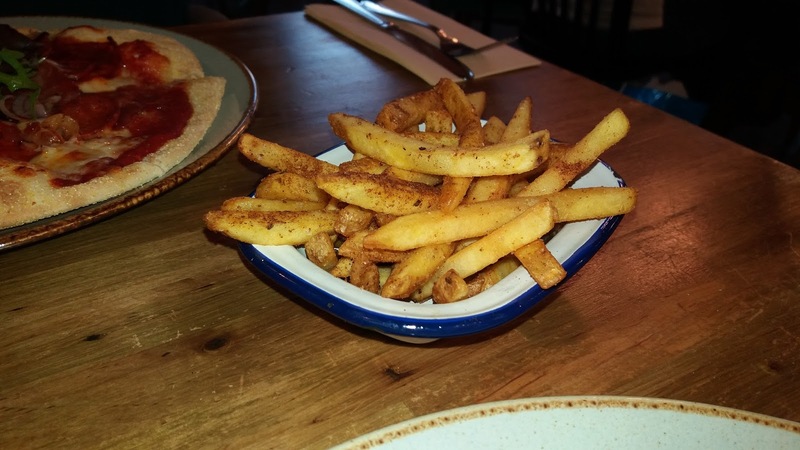 Light on the inside, crispy on the outside and with a lovely glaze. The one thing we didn't feel quite so positively over was the service. The young girl who was serving us for the majority of our meal was well turned out except for a hideous, dirty pair of training shoes which definitely didn't give us a good impression and the general attention of the servers needed a little more shoring up. With a little bit of work it could be of a high level and help to add to the diners experience. 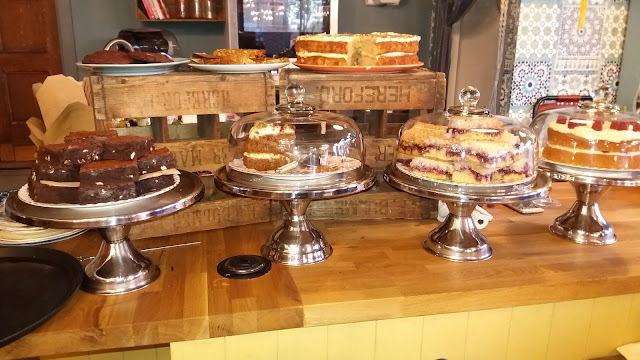 The real highlights of the Crimson Tree in Sherwood for us were the cakes. 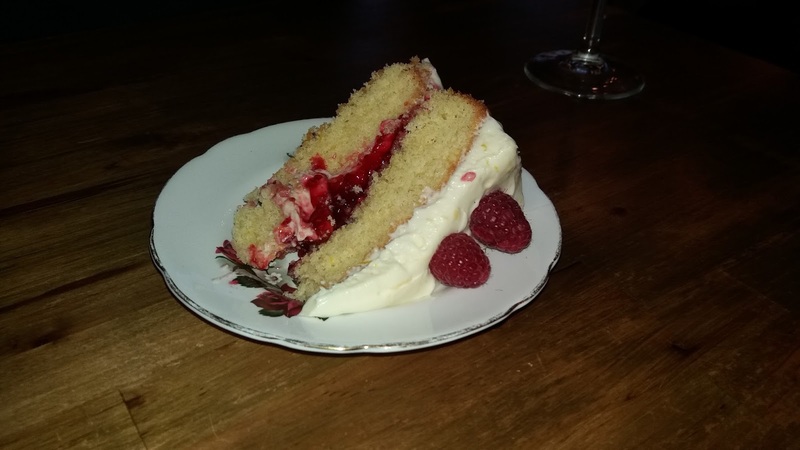 Mark had previously tried the lemon and raspberry cake and found it to be so good he opted for it again. 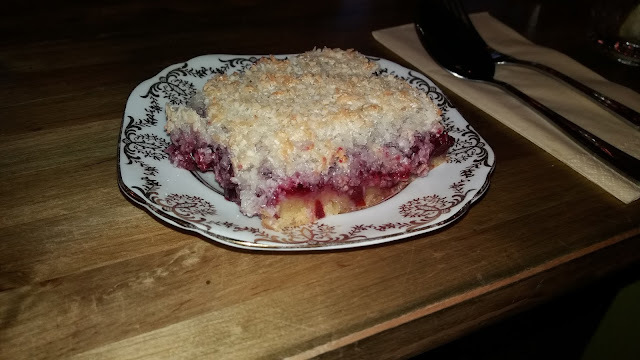 The coconut and cherry cake was very nice indeed. Well worth being tempted by. A good 3 inch by 3 inch slab and reasonably priced too.